LOCATION: Central Java and East Java Provinces,Indonesia. Administratively, Volcano Lawu located in two provinces of Indonesia,Central Java and East Java, but it's summit zone administratively located at Karanganyar,Central Java.Original past name of Lawu was Mahendra (Giri/Wukir Mahendra), divided into lawu old volcano and lawu young volcano.It's lava flow resource came from parasiter cones spreading around body of old and young Lawu volcano.Andestic lava was discovered at old Lawu volcano complex. As other volcanoes in Indonesia, Lawu perhaps experienced huge eruption already in long past time,prior to year 1600.However...in Indonesia, the oldest historical record of volcanoes eruption experienced by volcano Kelud in East Java,volcano Merapi in Yogyakarta - Central Java,volcano Raung in East Java, and volcano Gamalama in Ternate, Halmahera (Sutikno Bronto, 2001).So...volcano Lawu was excluded on this category. According to data source: Georisk at Buku Pedoman Analisis Risiko Bahaya Alam,Studi Kasus Provinsi Jawa Tenggah, volcano Lawu is classified as B-type active volcano as indicated by yellow symbol on map. 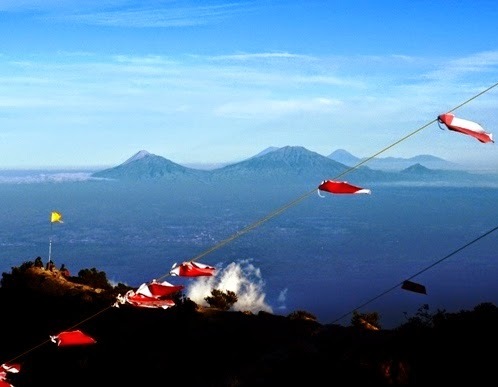 Therefore, volcano Lawu is classified as B-type active volcano on this page volcanotrekclimb.com. volcano phenomenons such active fumarole field,crater and hot spring are still existed on Lawu,locally called Fumarole Candradimuka at southern slope of Lawu and Fumarole TKB (Taman Sari Bawah) Cemoro Kandang which's also located at southern slope approx 1 km south of fumarole Candradimuka.While below Pos 4 of Cemoro Sewu trekking route,climbers-trekkers-hikers climbing up summit of Lawu normally get smell of low sulfuric gas along the paved path route of Cemoro Sewu Lawu. As other old volcanoes of Indonesia, Lawu possessing many summits due to nature erosion effects,but the highest one is summit Hargo Dumila 3265 m.This summit is still covered by adapted plants growing around summit zone Hargo Dimula.On summit,the rest of it's ancient crater is well visible. 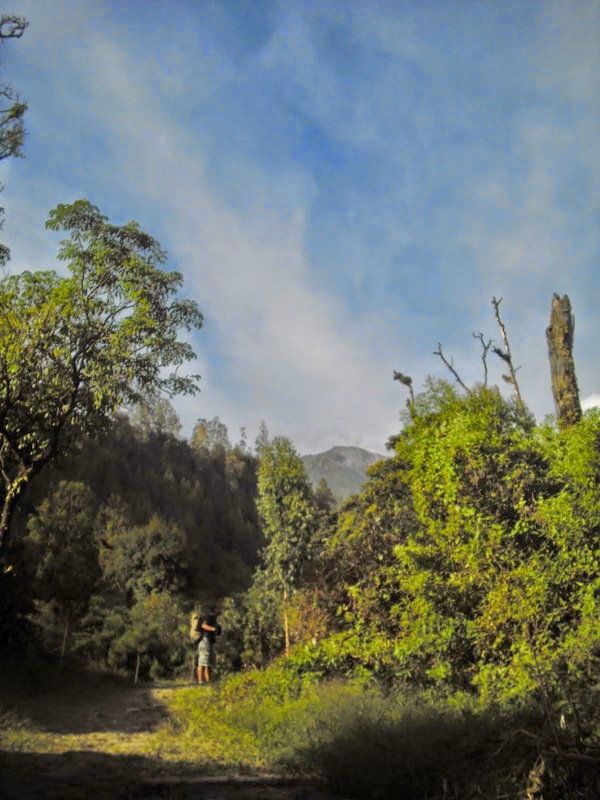 It is worthy to mention that lower to Lawu mountain slope is megalithic site facing to summit of Lawu, indicating Lawu zone has been inhabited by human being since long time ago. Higher from megalithic site, over 1000 m is complex of higher developed civilization indicating by the existence of Lawu group temple such Suku,Cetho temples and other temples.Among these temple,Suku is the most popular ones, a pyramid shaped temple of Lawu,but locally known as "undakan" shaped temple.The temple completed with Lingga and Yoni, a symbol of fertilization. 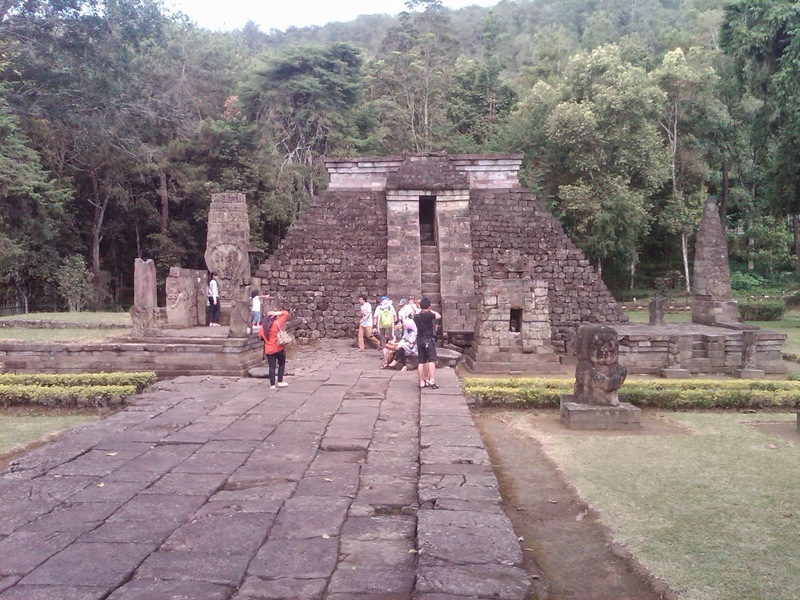 Today Lawu began to attracts many hikers-climbers-trekkers to come to experience it's fresh air and beauty of volcano landscape,as well as it's historical culture attractions such megalithic site and pyramid shaped temples on slope of Lawu that reflects past human cultural adaption on this old volcano. Due to mountainous topography,Lawu also provides many waterfall, new arrival ones is Jumog waterfall,located closed to popular Suku temple,and began to be known as "The Lost Paradise" by some travelers.